A new survey of prospective smartphone buyers has found that hype from the iPhone 4 has died down, and Apple's smartphone is only slightly more preferable to consumers than devices running Google Android. The results, released Thursday by ChangeWave Research, show that initial hype over the iPhone 4 has died down, and the competition between Apple's handset and devices running Google Android has returned to a horse race. Of 4,000 respondents polled on Sept. 23, 37 percent said they would prefer an Android phone, while 38 percent chose the iPhone. Though Apple is still the top choice by a percent, its number is reduced from the 50 percent of future smartphone buyers who said they would opt for an iPhone 4 after it launched in June. In the same time, Google has seen an increase from its June number, in which 30 percent of respondents said they would choose Android. "We've seen huge leaps forward for the Android OS in four of the last five ChangeWave surveys," the research firm said. "All told, it's a six-fold increase in consumer preference for the Google OS in a years time." Market dominance for Apple and Google has come at the expense of Research in Motion's BlackBerry, Microsoft's Windows Mobile, and Palm's webOS. Since June, customer intent to buy a BlackBerry went up just 1 percent to reach 6 percent. Its 5 percent total in June was the lowest ChangeWave had ever seen RIM's handset drop. Windows Mobile, meanwhile, lost a percent in the three-month span, and just 1 percent of respondents said they would like Microsoft's mobile operating system on their phone. 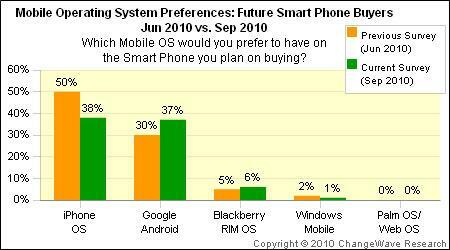 And 0 percent chose Palm and HP's webOS. Apple also leads in customer satisfaction, with 74 percent of respondents indicating they are "very satisfied" with their iPhone. Android came in second, with 65 percent giving such high approval. Earlier this month, ChangeWave revealed that the presence of Apple's iOS in the corporate market is still nearly double that of Google Android, but still well behind RIM's BlackBerry. And in August, another survey from the company found that iPhone 4 owners reported fewer dropped calls than those who have an iPhone 3GS.